Oh no! I really do need to eat my vegetables! Going grain-free and eating the greens I never dared to try. Time to do something with chicken... how about.... CHICKEN FINGERS! Chickens don’t have fingers you say? Well, that may be a topic for debate, but in the meantime I can certainly make "breaded" chicken deliciousness. First, cut up your chicken into finger sized pieces. In a small bowl, beat the egg. In another dish, put in almond flour, and seasoning to taste. I threw all kinds of flavors in there, but you could also make it really simple with just salt and pepper. Just lick your finger and dip it in the almond flour blend to see how it will taste as breading. Turn on the oven to 400º, grease a large stone or baking pan, and line everything up. I found it easiest to use a fork to dip several pieces of chicken into the egg, let the excess run off, and then put in the almond flour. After I had several pieces in the almond flour, I put the lid on the container and shook it around to coat the chicken, before using my fingers to transfer coated pieces to the pan. Bake at 400º for about 20-30 minutes, until cooked through, flipping once. Let them cool a couple minutes on the pan before transferring to your plates and dipping in homemade ketchup. Instant Icing! 1 tool, 1 dish, 3 ingredients. Mmmm... butter-fudge. Fermented Cod Liver Oil Giveaway! Want an be updated with new posts? I’m doing basically GAPS/SCD and allowing dairy if it is either GAPS legal or raw. For a time I made low oxalate foods as well. I also try to incorporate the practices found by Weston Price and described in Nourishing Traditions - sprouting, fermenting, good quality meats, eggs, etc. 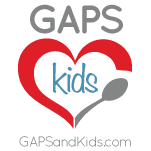 Read more about my food journey and why I chose GAPS. Catholic, SAHM, ECer, Photographer, Foodie. ©2010 Jen Pagano. Simple theme. Powered by Blogger.